I can't WAIT to photograph you & your adorable family! We are going to have so much fun! Please fill out the contact form to begin booking your family photo session. Follow me on Instagram for ideas on what to wear + a look behind the scenes. And sign up for my newsletter to find out about local photo events and pre-sale opportunities! 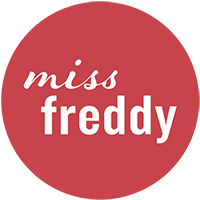 How did you find Miss Freddy? What's your favorite way to have fun as a family? I want Miss Freddy to take my photos!